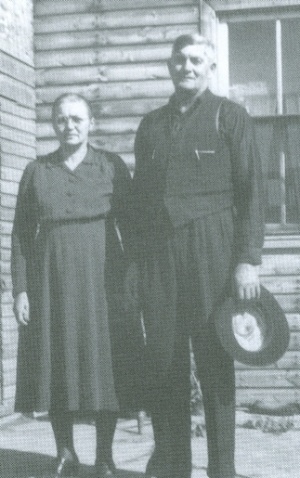 Abram J. Buhler: farmer and minister; born in Manitoba, Canada, on 5 March 1903 to Jacob and Anna (Klassen) Buhler, both of whom had emigrated in 1875 from the Chortitza Mennonite Settlement in Russia. He was the tenth of 11 children in the family. On 27 December 1925, he married Aganeta Peters, daughter of David and Elisabeth (Giesbrecht) Peters of Aberdeen, Saskatchewan, Canada. The couple had seven children, all of whom survived childhood. On 25 June 1948, Abram was elected minister of the Bergthaler church, and in February 1949, he was elected Elder, or Ältester. Later in life, Abram developed heart troubles and died on 13 June 1982 in Warman, Saskatchewan. As a child, Abram attended a local Mennonite church school near his family’s home a few miles away from Plum Coulee, Manitoba, studying to Grade 3 before leaving school. In his youth, Abram was known for his love of practical jokes and his considerable skills at boxing and shooting. After his marriage to Aganeta Peters on 27 December 1925, Abram and his wife at first lived with his parents until the chance came for the couple to buy a house with some land. Farming helped support Abram and Aganeta as their seven children grew up, the eldest already married and out of the house before the youngest ones were born. Abram became involved in the church, serving in various capacities over the years. In 1933, he was elected to the Waisenamt, where he managed investments and other financial matters for orphans. He remained on the committee until its dissolution in 1952, visiting communities throughout the region even during the difficult Depression years. Abram was also involved in the local group for young people, the Jugendverein, in addition to teaching Sunday School classes at his home. Aganeta was also active, teaching Sunday School classes to younger children, as well as participating in an interdenominational sewing circle, called the Nähverein. After one of the ministers of the Bergthaler church died in 1947, the congregation organised an election, held on 25 June 1948; Abram, despite having many doubts about his suitability for the role, was elected as the church’s sixth minister. On 19 February 1949, the Bergthaler church elected him Ältester, only nine months after he had become a minister. His ordination took place on 22 February at his home church. As part of his new church role, Buhler began preaching and performing other duties in addition to his work on the farm. While Aganeta ran a ladies’ aid society in Warman, the church leaders held a conference in Aberdeen in 1952, followed by a second conference in Swift Current, Saskatchewan, in 1955. Abram also helped form a new Bergthaler church in LaCrete, Alberta, frequently returning there to baptize people or to serve communion. In his years as Ältester, he ordained 12 ministers and also helped launch a joint venture of the Bergthaler and Old Colony churches to build a seniors’ home in 1968. He frequently invited guests to speak in worship services and often helped resolve disputes between church members, while also helping to keep congregational meetings orderly and friendly. In 1969, Abram and Aganeta sold their farm and moved to the town of Warman, Saskatchewan. As his health deteriorated, Abram began to consider retirement and in 1975, he asked his church members to elect another bishop. He and the new elder worked together until Abram died suddenly on 13 June 1982 at his home in Warman. Abram J. Buhler was a dedicated church leader whose work helped strengthen the congregations where he served. He left an example of persistence and faithfulness for future generations to follow. Buhler, Abram. "Ältester Abram J. Buhler 1903-1982." Preservings (June 2003): 98-103. Huebert, Susan. "Buhler, Abram J. (1903-1982)." Global Anabaptist Mennonite Encyclopedia Online. 2009. Web. 25 Apr 2019. http://gameo.org/index.php?title=Buhler,_Abram_J._(1903-1982)&oldid=100430. Huebert, Susan. (2009). Buhler, Abram J. (1903-1982). Global Anabaptist Mennonite Encyclopedia Online. Retrieved 25 April 2019, from http://gameo.org/index.php?title=Buhler,_Abram_J._(1903-1982)&oldid=100430. This page was last modified on 26 August 2013, at 12:20.